A system neutral adventure. The players discover a town beset by a mysterious illness with symptoms worse than death. It breeds violence, madness, and mutation. It turns people into things that are no longer themselves. The Inquisitor General has been warned. He's on his way here. When he arrives he'll burn every building to the ground and torture everyone living until they confess to the devil worship that obviously brought this evil into the world. This is a location based adventure with the benefit of being easily dropped into just about any rural location. The village of Opeth is generic enough to be useful in many campaigns, but remains interesting, primarily through the strange events taking place within. The adventure is clever, multi-layered, and delightfully weird. Without spoiling much, there is an Expedition to the Barrier Peaks style twist, throwing some sci-fi elements into the mix. Players with a taste for violence, or who are overly cautious, are unlikely to discover this side of the adventure. This may not be a bad thing, but be prepared for your players to think you just ran an adventure about demons poisoning a town. The dungeon itself is small, and is creatively rewarding. The most valuable loot is information. Clever players will find a way to leverage this, while less creative ones will feel betrayed at the lack of coin. The townsfolk are colorful enough that I could picture myself using the village several times through the course of a campaign, and have the events of the module occur during a second or third visit. I think this is pretty necessary. The timer counts down to another disaster for the village (not so much the players), and this only really matters if the players care about the village and its inhabitants. Now for the parts I didn’t like. The dungeon had some really interesting exposition that unfortunately doesn't add anything. The dungeon appears to be a demon lair, but in reality it’s an abandoned cultist hideout currently inhabited by aliens. The issue is that much of the true nature of the dungeon isn’t going to be discovered by even the most clever players. All it is going to do is reinforce their assumptions about the “demons”. I’m all for some nice exposition, but only if the players have a reasonable way of discovering it. On the plus side, all it would take to fix this is to make the history of the cult discoverable in the village. An old book on a shelf or something of that nature. The adventure’s best feature is its main hook. Disease isn’t a common enough adversary in role playing games. And few diseases are as interesting and creative as popping. But its best feature is also its worst failing. Popping causes mutation, and the lack of a mutation chart seems like a major oversight. The addition of this could add a lot of value to the book as a resource. The maps are rough, but functionally beautiful. It is hard to say if they were painstakingly made by an amateur, or made to look slightly rough by a professional. Either way they have a nice chaotic feel without sacrificing useability. The art is serviceable, but unspectacular. Alternating between collages and drawings, there are seven full pages of art in the 32 page PDF, in addition to a bunch of smaller pieces. The cover gives a great feel for the style, so props to the artist for setting the tone perfectly. While I like the idea of the collages in theory, to create a panicked hodge-podge of images to demonstrate the panicked confusion of the village, it doesn’t work as well in practice. The collages are relatively bare, only including a few images in each. To really capitalize on the atmosphere, a little less white space would help. The drawings were all great quality, but with nearly 20 pieces of art in the book, a few felt unnecessary. But hey, I’m never going to complain about getting more art. While I haven’t ran the adventure yet, the layout is functional, and all necessary information was logically placed for easy access. 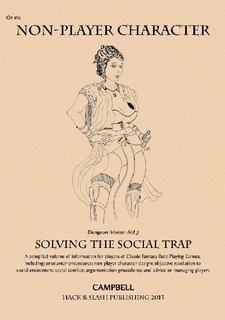 For a party of smart players it will provide a unique and enjoyable experience that can be easily added to virtually any campaign. There is no assumed setting or system, so any GM would do well to have this on their digital bookshelf. The adventure is streamlined, and almost all the content directly relates to the main hook. While that content is great, if you are intending to pull out bits and pieces for your game, you may not find much that is easily transplanted. Either way, the art and writing make it well worth the price tag. If you like to pull bits and pieces from modules and drop them in your games, this probably isn’t for you. The village, NPCs, and dungeon (while all great) are all very cohesive and wouldn’t make a lot of sense if taken away from the cohesive whole. Popping is a great poison/disease that would be a great addition to a lot of games, but the lack of a mutation chart takes a lot of the value away. With that being said, if you are running a hex crawl, you probably can still get your money’s worth out of the maps and concepts even if you don’t want to use Faux Pas in its entirety. 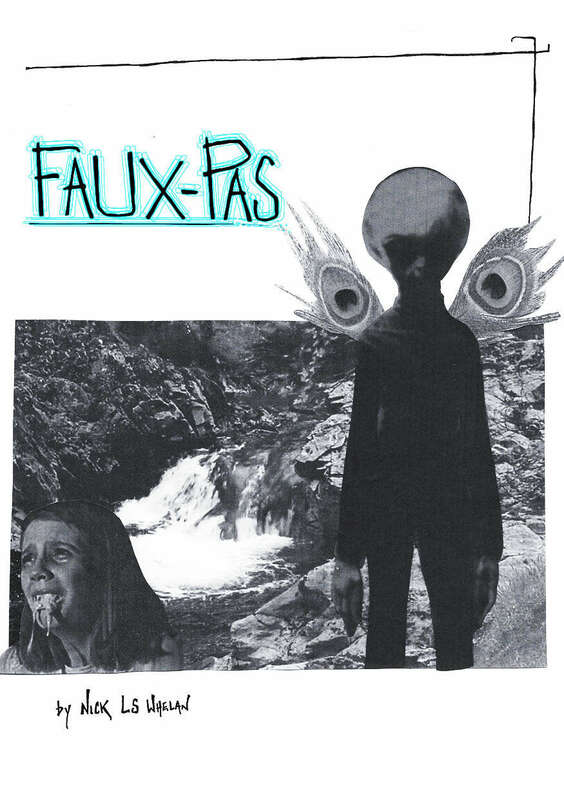 Faux Pas is the first book by Hocus, a new publisher with a few interesting projects on the pipeline. The author, Nick LS Whelan, has been providing free resources for years, including several short adventures, and a wealth of resources over at his blog. Contact me to request a review!